The Greater London Council were looking for something to mark the city's 'Peace Year', in 1984 and were taken with the idea of a Peace Pagoda. One had been opened in Milton Keynes, in 1980, that had become a huge success, so the GLC contacted the Nipponzan Myohoji Buddhist Order, who had been constructing Peace Pagodas around the world, since 1947. Buddhist monks and nuns, from the Nipponzan Myohoji Buddhist Order, joined by volunteers began construction of the Peace Pagoda in 1984, with it being being completed the following year. 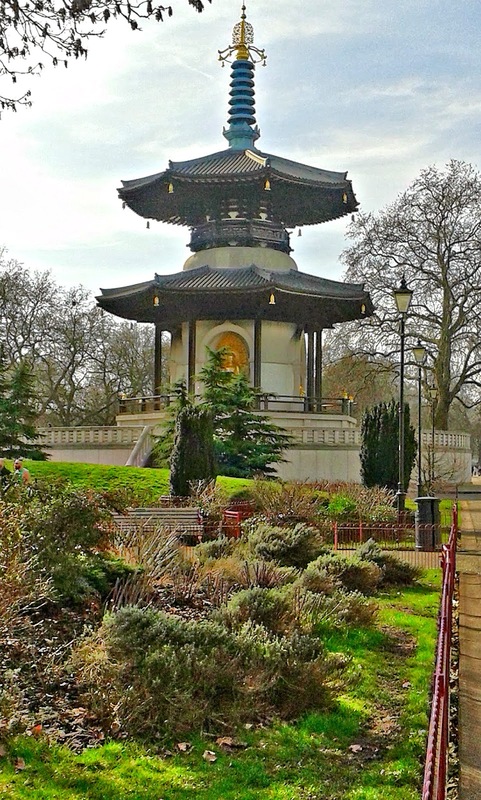 Constructed of wood and concrete, with four gilded bronze sculptures of Buddha adorning the sides, the Peace Pagoda stands 33.5 m high and is situated alongside the River Thames, in Battersea Park, midway between Albert Bridge and Chelsea Bridge.